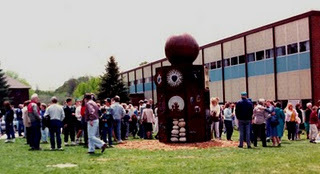 This page is dedicated to the “Reflections From Nature” sculpture designed and constructed by Winthrop High School students and staff in the year 1990. 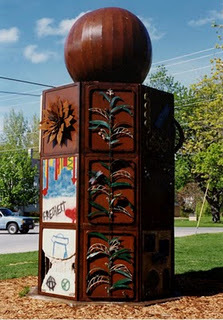 As it was being constructed, Keith Leavitt, one of the lead faculty members involved in the project, used an early consumer camcorder to document the planning, construction, and unveiling of the sculpture. The sculpture was completed on May 20, 1990. Precisely twenty years later the Rambler Productions crew volunteered to update the documentary with a new introduction, remastered original, and new documents and photos. The DVD is available at the town library and at all three Winthrop Public Schools. Use the links below to download files with statements from the artists and students who worked on the sculpture, magazine articles, newspaper articles, and photos about the sculpture.